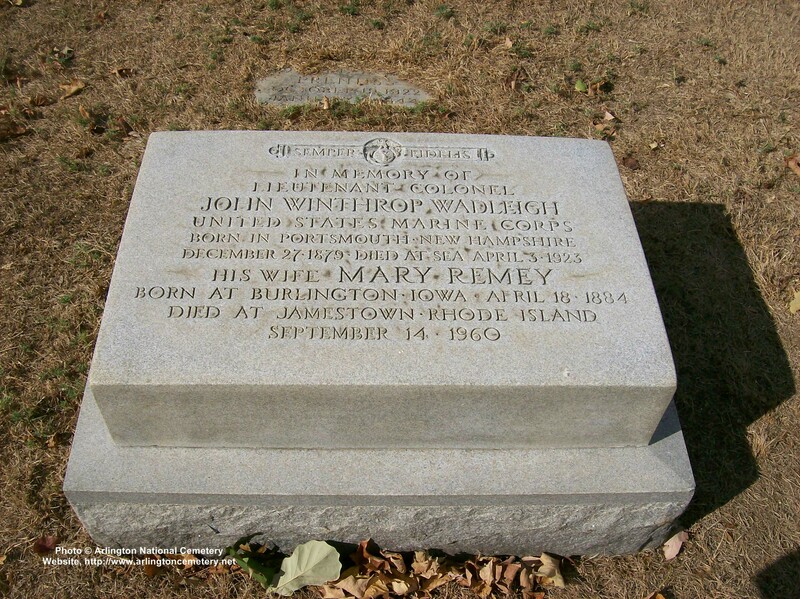 I am Mary Remey Wadleigh, daughter of George Remey Wadleigh, granddaughter of John Winthrop Wadleigh, great granddaughter of George Collier Remey and great niece of John Terry Remey. I can tell you something about all of these men. My father, George Remey Wadleigh, was born to John Winthrop & Mary Remey Wadleigh in Washington, D.C. on September 13, 1920. He was their fourth son. 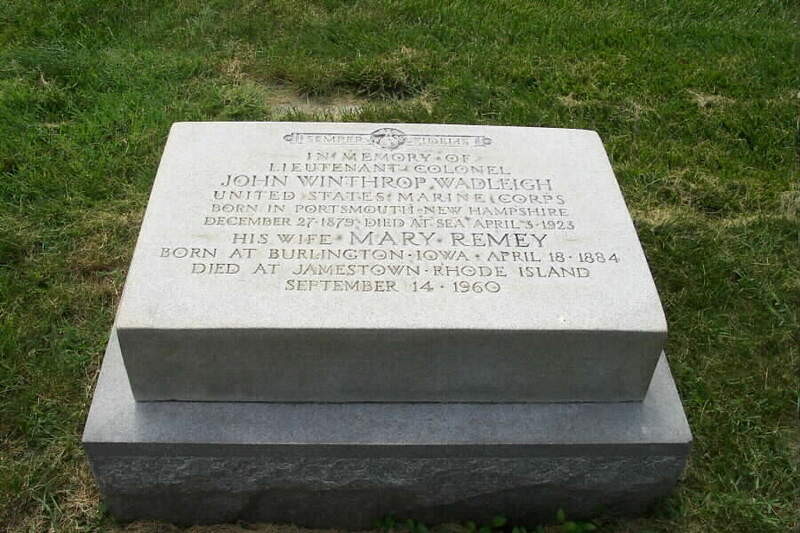 His older brother, John Remey Wadleigh, attended the U. S. Naval Academy, served with distinction in World War II and was eventually commissioned a Rear Admiral. Infant twin brothers were born and died at or shortly after birth in 1917 or 1918. Their graves are in the family plot also, though the small stones may not be readily identifiable now. My father graduated from Harvard College in 1942, served with distinction in the Navy during Worlfd War II and became a Foreign Service officer in late 1947 He died of polio January 13, 1950, having become ill traveling from Bordeaux, France to Lisbon, Portugal, where he was to assume a new post at the U. S. Embassy. He left his widow, Josephine Kidder Wadleigh and three very young children. I was just a week short of 3 years old, my brother David Howland Wadleigh was 20 months old and my brother George Remey Wadleigh was just four weeks old, when our father died. George Collier Remey was also a distinguished Admiral and a close friend of the above-mentioned George Henry Wadleigh. It must have been a great joy to them both when their children fell in love and married -- and a great tragedy when John W. Wadleigh died so young. I believe that both Adm. Wadleigh & Adm. Remey saw action in the Civil War, at the very beginning of their naval careers. They were both honored by having destroyers named for them during World War II. DD688 was the USS Remey and DD689 was the USS Wadleigh. There is a great deal of information about them in the archives of the Naval Academy, much of it online. John Terry Remey was the youngest son of Admiral Remey. Although he was still alive when I was born, I believe, I do not remember ever meeting him and I do not know much about him -- except that he graduated from Harvard College. I hope this is somewhat useful. Please contact me if you need more information. I can probably find out more, if you need it. Other relatives are also buried in Section 15 of Arlington National Cemetery. They are: George Collier Remey, Rear Admiral, United States Navy; John Terry Remey, Lieutenant (jg), United States Navy; and George Remey Wadleigh, Lieutenant, United States Navy and Foreign Service Officer.